There was a time when staying in a hotel was a treat unto itself. However, the typical guest today does not view the hotel as the destination; they are seeking to visit a locale – a place. The location is the destination. The hotel is the accommodation during their visit. It is, perhaps, a subtle shift, yet very meaningful for hotel operators. Hotel brands are taking note and adapting brand standards in response. Architects have long championed this approach, but now hotel developers, managers, and the brands themselves are recognizing the value of a site-specific design approach. The design for a hotel should take its cues from elements of the surrounding architecture to create a modern yet sensitive response. The design for a hotel should acknowledge the local climate, flora, fauna, and terrain. It is appropriate for a guest to expect a waterfront hotel to offer a different experience than one perched on a mountain top or one offering desert vistas. No one is suggesting that brand standards be chucked out the window -- just that there are a variety of ways to appropriately deliver the experience a guest expects from a brand and from a destination. Huang Pu River showing historic Club building in front of new guestroom tower. 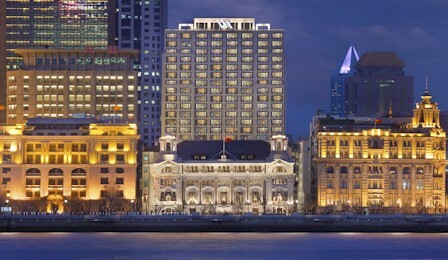 Take, for example, the Waldorf Astoria Shanghai on the Bund. It is located, as you might gather from the name, along the historic bund waterfront in Shanghai. This project preserves and updates the former Shanghai Club at historic No. 2 Bund. This six-level Baroque revival building was first opened in January 1910. Over the years, the building had taken on a number of roles, perhaps most famously as "The Shanghai Club", a gentleman's club that primarily served expatriates during the Jazz Age. During the 1920s and the 1930s, the Club was Shanghai's most exclusive gathering venue. The Long Bar, an unpolished mahogany bar that measured close to 111 feet in length, was quite the attraction. One could chart the social status of the patrons as the scale changed up and down the bar's expanse, with the more prestigious stances sporting views of the Huangpu river frontage. During WWII, the Japanese Navy seized the building as an officer's club. Following the war, interiors took on a new personality as the bar was ripped out and much of the Western influences were purged. Then, in 1989, the former bar area became Shanghai's original Kentucky Fried Chicken outlet. While the building has gone through several dramatically different transformations in its life, with grand touches such as its Sicilian marble staircase, stained glass imported from England, exquisite moldings, and wrought iron balusters, there is just no hiding the fact that the building is meant to be "fabulous." A careful combination of preservation, restoration and recreation returns the building to its original glory, while transforming it into sumptuous suites and grand public spaces for the new Waldorf Astoria Shanghai on the Bund. The unusual triangle-shaped elevator in the lobby was among the wonderfully eccentric features now restored to functionality within the historic club building. Tucked into the curving staircase, Shanghai's last manual elevator is also China's oldest still-operable elevator.